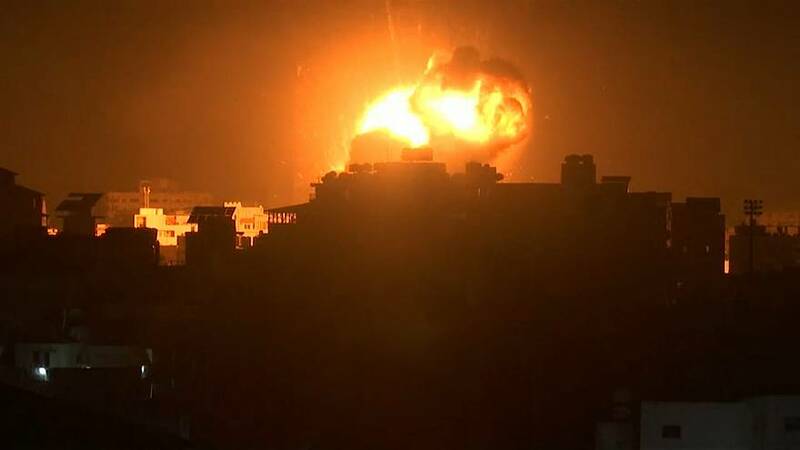 The office of the leader of Hamas, which controls Gaza, was targeted along with the group’s military intelligence headquarters, according to Israel Defence Forces (IDF). Israel says the airstrike was in response to Hamas firing their longest range rocket into Israel for five years. Gaza’s health ministry said seven people had been injured in the strikes. Some residents in Gaza spoke of their shock and anger at Israel’s military action. Yousef Abu Shaban’s house was damaged in the strike. He said: “Where are we supposed to go, where are we supposed to live. Our children and families have become homeless. We do not know where to go anymore." Earlier the IDF blamed Hamas for the rocket attack on a small Israeli community north of Tel Aviv. It was the furthest a rocket from Gaza had travelled sing the 2014 conflict. The recent increase in violence led to Israeli Prime Minister Benjamin Netanyahu cutting short his trip to Washington. Military action continued overnight as more rockets were fired from Gaza. Israeli planes fired missiles into central Gaza City and the eastern Shujaiya district. Israeli authorities also closed roads and halted farm work in area near to the boundary fence with Gaza. Despite the increased tension no Palestinian militant group claimed responsibility for the rocket. One Hamas official was reported as saying it had "no interest" in such an attack.